As many of you know this Saturday, May 5th is the 144th annual Kentucky Derby! In honor of this historical event, we’ve decided to look at some facts about the race, the way horses were originally used as a mode of transportation, when transportation evolved from a horse to a vehicle and how the vehicles created a demand for the parking garages and studies we are involved with today! The Kentucky Derby, first held in 1875 at Churchill Downs racetrack in Louisville, is the longest-running sports event in the United States. The mint julep, the Derby’s traditional drink, is wildly overpriced at $11 a pop. Connoisseurs of bourbon consider it a waste of good whiskey. On Derby Day the infield will hold around 80,000 revelers, making it Kentucky’s third-largest city, behind Lexington and Louisville. The 1¼-mile distance has been standard since 1896. The first 21 Derby’s were contested at 1½ miles. The domestication of the horse dates back to around 6000-5500 BC and has had a significant impact of many aspects of human history and culture. Although there is much debate about the history of domestic horses, research indicates that horses were first domesticated by the Botai Culture of Kazakhstan. Primarily between 1815 – 1915 Concorde buggies were a primary mode of short-distance, personal transportation, while horseback riding in towns and rural areas was much less common. Buggies required at least crudely graded main roadways, where horses could go almost anywhere. The growing use of buggies for local travel expanded, along with stage lines and railroads for longer trips. In cities and towns, horse-drawn railed vehicles gave carriage to poor workers and the lower middle class. The upper middle class used buggies, as did farmers, while the rich had the more elegant 4-wheel carriages for local use. In the late 19th century, bicycles became another factor in urban personal transport. In the United States, hundreds of small companies produced buggies, and their wide use helped to encourage the grading and graveling of main rural roads and actual paving in towns which provided all-weather passage within and between larger towns. By the early 1910s, the number of automobiles had surpassed the number of buggies, but the use of buggies continued well into the 1920s in out of the way places. As more and more people bought cars, the need for a place to park grew immensely. The first ‘parking garage’ dates back to the early 1900’s and doesn’t look like most garages we are familiar with today. Parking garages in this time were multi-car buildings which often mimicked the look of homes or multi-story commercial buildings. Sometimes parking garages were horse stables, where they would charge the same for parking a car as they did for stalling a horse. The first multi-story parking garage that we know of, was built in 1918. The early parking garages were staffed with parking attendants who would park the car. In some cases, the car was placed on a platform with car lifts and would automatically be moved to an available parking space. 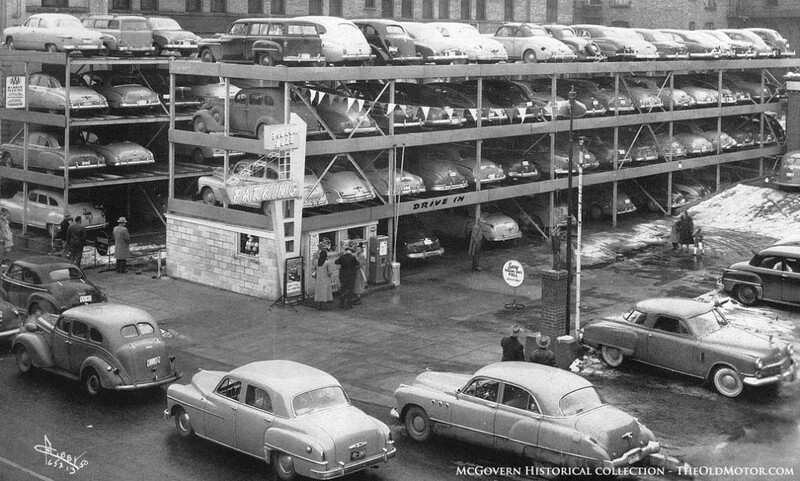 In the 1950’s there was a construction boom when it comes to parking garages with self-service parking garages. There were several innovations in the design and construction self-service parking garages. Most of what we see today in North America are self-service parking garages. However advancements in technology are leading to increased construction of automated facilities.